Tigers & Strawberries » What Does Fresh Turmeric Taste Like? What Does Fresh Turmeric Taste Like? I very abjectly apologize for keeping everyone in suspense over the question of what, exactly does fresh turmeric taste like. I didn’t get to apply my culinary skills to that conundrum until last night, and then, instead of blogging about it, I blogged about cats instead. Why:? Because I am wicked, and wanted people’s minds to burn all through Christmas day, wondering about those turmeric roots sitting in the produce drawer of my fridge, and how they tasted. In reality, I figure very few people are waiting with bated breath to hear what I thought of the lovely vibrant orange rhizomes (for turmeric is more properly called a rhizome rather than a root, being a swollen, underground stem rather than a true root) but, I will write about them anyway, just for fun. 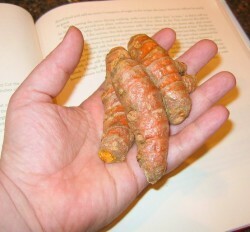 As you can see, turmeric is sized and shaped similarly to its cousin, ginger, though the dull brownish skin is thin, much more like the skin of young ginger. It scrapes off easily with the edge of a spoon, revealing a throbbingly vivid orange hue that made me think of cotton saris and tropical flowers. When I peeled it, I was careful to wear latex gloves; knowing as I do exactly how easily the dried, powdered form stains skin, I was taking no chances with the fresh juice. The scent of it was interesting: I can discern a hint of the dried turmeric smell, which always strikes me as somewhat dusty and dim, however, the fresh rhizome is pungently aromatic, with a spicy savor similar to the scent of fresh galangal, but not as strong. It has a vaguely floral smell, too, that somehow reminded me of jonquils or daffodils. The recipe I found was for Catfish Rounds Simmered in Turmeric-Flavored Coconut Sauce, and since it involved coconut milk, catfish, galangal, lemongrass and turmeric–all favorite ingredients in this house–I figured there was no way it could be bad, so why not go for it? I have never had any recipe from Kasma turn out badly, and this one was no exception. I did modify it somewhat, but mostly only from necessity. I only had access to boneless filets of catfish, so, as I could not rely upon the head, bones and tail of the fish to flavor the sauce, I added a teaspoon of Penzey’s Seafood Base to the coconut milk as it simmered. I also allowed the sauce to simmer for a good twenty minutes or so before adding the fish and cooking it for another twenty minutes, just to allow the flavors to develop more fully. Finally, though I followed her instructions and made the dish salty (Kasma notes in her instructions that a direct translation for the Thai name of the dish comes out to “salty boiled catfish in coconut milk), I found that the saltiness needed a little bit of acidity to balance it, so at the end of cooking, I added the juice of one half of a lime. 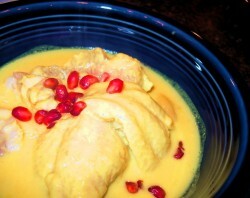 I ended up also adding a garnish of pomegranate seeds, just because I thought that their shimmering rubine color would look lovely atop the creamy yellow, turmeric-flavored sauce. Speaking of which–since I had a bit less turmeric root than she calls for in her recipe, instead of just smashing it with a cleaver as she suggests, I cut it into slices and then crushed it, in order to expose more surface area to the coconut milk than would be possible by her method. This would allow for maximum extraction of flavor and color from the rhizomes by the coconut milk. And it worked beautifully–I was surprised to see threads of yellow spiralling out from the slices of turmeric root after I tossed them into the simmering coconut milk. Within mintues, the formerly snow-white liquid had become the color of butter; by the time the dish was finished and ready to serve, the color had deepened to be close to a true daffodil yellow. Not really a curry, nor even truly a soup, the dish is meant to be eaten with plenty of plain steamed jasmine rice, and is meant to be a sweet, salty foil for a hotter, spicier dish. 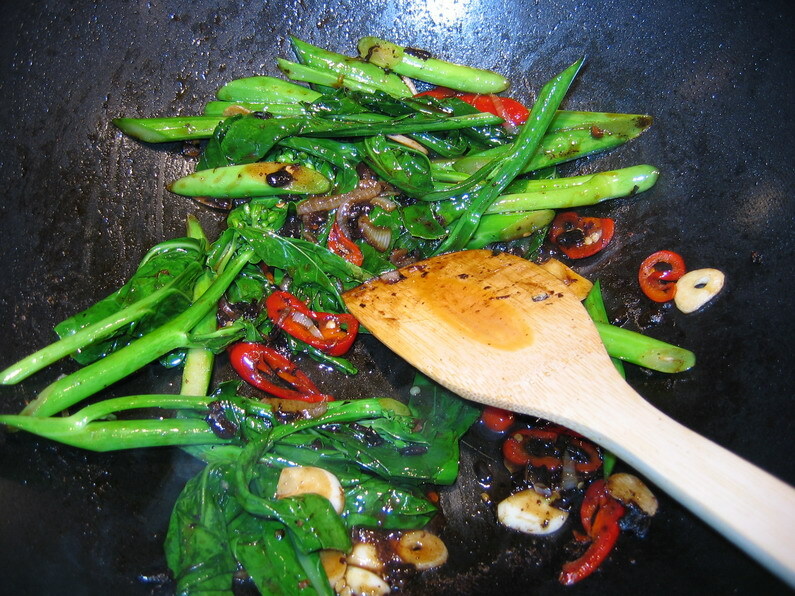 To go with it, I stir fried gai lan with ripe jalapenos, onions, garlic and fermented black beans, then added oyster sauce and a bit of Shao Hsing wine to deepen the flavor and balance all the heat-producing ingredients in the dish. Together the two dishes were a study in contrasting colors, flavors, textures and aromas. The catfish was well-loved by all three of us, even though Morganna expressed surprise to hear that Thai people love catfish as much as we do. “I thought only hillbillies and southerners liked catfish,” she said, as she plucked a morsel of it up with her chopsticks and examined it before popping it into her mouth. Kasma notes that the catfish is good reheated the next day, and in fact, it tastes even better after sitting overnight in the refrigerator. I don’t know about that yet, as I haven’t yet sneaked a taste of the leftovers. But when I do know, I will be sure and tell everyone what I think. Unfortunately, after reading this, I have simply made myself more disappointed I live in an area with little access to fresh “exotic” produce. I will definitely be looking out for it since I love the colour and flavour of turmeric. I want gai lan first, though. Holy cow! This meal sounds amazing. I have been a wee chicken when it comes to making anything with coconut milk in it. I do love Thai food….love it….but am very intimidated by it. Perhaps one day I’ll give it a try, but for now, will live vicariously through you and this post! Gai lan is definately more nutritive, and probably more versatile as an ingredient than turmeric, but they are both pretty darned awesome, Saeculorum. I have yet to make it in a way I haven’t liked. We are off to Columbus tomorrow, so I will pick up a larger bag of turmeric roots, as Kasma assures her readers that one can keep them for close to a month in the fridge if one is careful. I also want to experiment with freezing it to see if it preserves the elusive fragrance and flavor. KT–there really is nothing to fear with Thai food. I really should return to my habit of cooking a good amount of Thai, but I have been concentrating so hard on Chinese, that I forget to make Thai. But, as there is no really good Thai restaurants around, I should return to my habit of having it once or twice a week, and then writing about it. Like Chinese, Thai is all about flavor and texture balance, both within a dish and within a meal. Once you start understanding that key principle, and become fluid with the basic flavors of Thai food and the ingredients that create them, Thai becomes a lot less intimidating. If you can find copies of Kasma’s cookbooks at a reasonable price on Ebay, I urge you to pick them up. She will go a long way in explaining the philosophy of the Thai kitchen to you, which, for me, was essential to unlocking the flavors and textures of the food. Great post. I’ve been intrigued by turmeric for a little while now and have been putting the powder on everything. turmeric has been touted as protecting against alzheimers. it is extremely high in anti inflammitory agents. Wow! 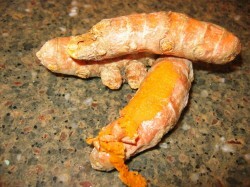 I can’t recall ever seeing such crisp pics of the turmeric root in its natural form. I’ve always known it as a powder. If I had to summarize the taste in one word, I would say “earthy.” This is as delicious to some people as it is wretched to others.